Creating content that attracts prospects, keeps customers engaged and creates conversions all at the same time is definitely not easy to do! I love a good journey, and that’s exactly what I’ve been taking you on for the last month or so – a journey to create a local content marketing plan that is easy to implement and evaluate. Yes, this journey includes measuring and evaluating the results. As this journey comes to an end, here’s a refresher: I started by covering the 5 Steps to a Local Content Marketing Plan, then began a deep-dive into each one of the steps in part 2, part 3, and part 4 of the series. Today, I’m wrapping up the journey with how to measure and evaluate the success of the local content marketing plan. To gauge the results of your efforts you must measure. 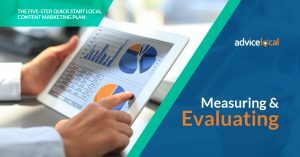 If you plan the evaluation right, all you’ll need to do at the end of the local content marketing initiative is to aggregate the data from the various metrics you’ve gathered, then spend a bit of time analyzing what it means. On one level this analysis will be relatively straightforward, because you will be comparing results data against baselines and benchmarks that you identified earlier in the process. But there’s a catch: you need to connect the results to your content. Regardless of your results, whether strong or weak, you need to know if they were influenced by local content marketing efforts, or by something else. The more time that elapses between posting content and seeing evidence of results, the more difficult it is to connect the two. Furthermore, the ability to chart connections depends a good deal on the kind of business you are marketing and how closely the things you measure overlap. For instance, how are clicks, likes, and comments related to overall marketing goals, in addition to the marketing of a specific piece of content? If the goal is to get more in-store traffic and you achieve that, how will you know that it’s a result of the things you measured? Do more clicks translate into more in-store traffic? If the goal is to get more sales, like in the example used for the architect earlier in the series, then the sales funnel stages the prospect is in could be significantly longer, and you could have several different marketing initiatives targeting them. Example: The initial goal was to get them to come to an event at the office. They attended, went to the website, read an article about architecture and downloaded an eBook – and now they are potentially in two different sales funnels. If there isn’t a CRM in place to track all the campaigns a prospect is in, I highly recommend you consider it. The things that you measure are usually proxies for the things that you really want to achieve. As an example, if you’re looking to boost in-store traffic, then it doesn’t make much sense to measure online engagement (clicks, likes, etc.). Instead, ask yourself this: What kinds of things will indicate the business is getting more in-store traffic? If this is the goal, you may include a discount code in the online content, then count the number of in-store customers who use the code. This will give you an idea of how many customers came to the local business as a result of seeing the content on the website or social media. You could most likely have different measurement indicators for each piece of content. For example, the graphic designer (used as an example in earlier posts) wants to get clients for her website design business. Using a tool like Google Analytics, she can track the numbers and demographics of people who viewed an article on her website – who clicked from perhaps Facebook or Twitter and then clicked through to her website to see her portfolio. To track these metrics you would need to have Google Analytics and goals set up. The graphic designer can also chart the progress of a given user, to see whether – after viewing her portfolio – they completed a contact form, and later, if they actually hired her! She can also identify which pieces of Facebook content were most effective in driving traffic to her site, and then refine her social media content going forward. Like the business owner above who wanted to increase in-store traffic, you may get to the evaluation step and find that your proxy measurements are not compatible with the goals. In some instances, you may find that the goal you initially established is too big to be achieved in a single local content marketing campaign. In that case, you would need to revise that goal to be more in line with the things that can be measured. What’s the bottom line to all this? Goals, audience, content topics, channels, and measurement indicators are all part of a circular planning process. Once it is mapped out it can be used repeatedly to cultivate new customers – and deepen the loyalty of existing ones. Unlike traditional marketing strategies, content marketing is best implemented as an ongoing process, with its results viewed as cumulative equity in the brand. And again, as mentioned in Part 4, do create valuable content based on the E-A-T concept of Expertise, Authority, and Trustworthiness. Google loves high-value E-A-T content and the happier you make Google, the higher the content will rank in SERPs. As we know, all good things must come to an end, and that includes this series. If you have just landed here at the end without reading the preceding posts, Parts 1–4, then start here and work your way through them individually. One last thing – to successfully track behavior, to measure success and conversions beyond a solid local content marketing plan, you will need a solid foundation. This foundation is part of the beginning, it’s not the goal itself. It starts with the website, moves into Google Analytics set-up, goal tracking, and much more – and the Advice Local team is here to help you get started from that solid foundation! Request a demo and learn more today! The post The Five-Step, Quick Start Local Content Marketing Plan: Measuring and Evaluating appeared first on Advice Local.